Of course you can also purchase your tickets directly at the FunPark cashier. Thanks to the eight ticket desks at the main entrance you do not have to wait long for the playing adventure to start. The date you have purchased your online ticket for is binding. The ticket can only be used at the PLAYMOBIL-FunPark in Zirndorf. Please print this ticket before your visit and bring it with you on your visiting day. If you have purchased more than one ticket, please make sure that you have printed all of them. With your ticket purchase and use, you accept the Terms & Conditions of the PLAYMOBIL-FunPark online shop, as well as the FunPark Rules. Please keep your ticket in a safe place. We do not accept liability in case of loss, damage or theft. Tip: Visit our park outside school holidays or on weekdays. During these times, you can enjoy playing while there are less visitors around. The FunPark has a modern car park routing system, which will help you park in one of over 3,000 parking spaces provided. In addition to 2 parking garages (which also provide disabled parking), open-air parking is also provided. You can also easily reach us by public transport. Get your season ticket 2019 for 45 €! 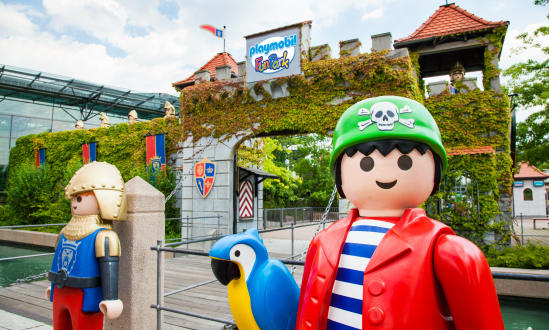 Visit the PLAYMOBIL FunPark as often as you like! The season ticket is available at the entrance cashiers. The personalized ticket is made for you at the FunPark Shop. *from 04.11.2019, the FunPark outdoor area and HOB-Center are closed; free entry to the indoor climbing area. The season ticket can only be issued at the FunPark – apperance in person necessary for printing a photo on your card. Alternatively you can also purchase a voucher in the ticket shop.